Disposable medical gloves are used extensively by many professions – doctors, nurses, dentists, cleaners, processed food servers, mechanics, and more. While non-medical professionals can use it as an alternative, those serving the chemical industry or healthcare industry have to use them compulsorily. To make things easier for you, here we list the 10 best medical gloves in 2018 based on their performance, features, price, and quality. But before we move ahead, it is important that you get aware of the different types of materials used for making these medical gloves. We can also consider them as the different types of medical gloves. The use of medical gloves plays an important role in reducing the transfer of microorganisms between patients and healthcare workers, and vice versa. 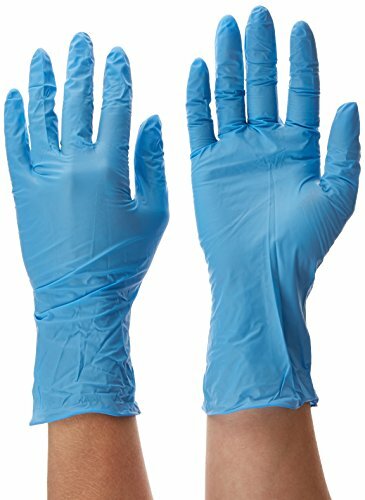 These medical gloves also prevent the exposure of bodies and skin from hazardous drugs, chemicals, and numerous cleaning agents. In simple terms, medical gloves turn out to be the finest way to avoid exposure to transferable infections and harmful pathogens. It offers high durability due to their damage resistant nature. But just like other products, even medical gloves vary in features and price. Hence, before you rush to buy a medical glove, it is vital to keep a few things into consideration. The functionality of every medical glove is the same that is to prevent the transfer of harmful microorganisms and chemicals from one person to the other. But there are different types of medical gloves available, which differ on the basis of materials used to prepare them. The NRL gloves are the dominant choice among healthcare workers for numerous years as they offer great protection to the users. The nature of materials lends a proper fit that offers comfort for the user and allows convenient hand movement. Natural Rubber Latex gloves have a watery suspension of minute polymeric particles. The material is obtained from the Hevea brasiliensis tree. Latex is made of around 34% rubber polymer, 60% aqua, and 2 % protein. The remaining part is made of sugar, fatty acids, resins, and ash. NRL is transformed into medical gloves undergoing complex manufacturing procedures. To enhance vulcanization and lasting preservation, numerous chemicals are added. These gloves have high flexibility, tensile strength, and excellent resistance to damage. 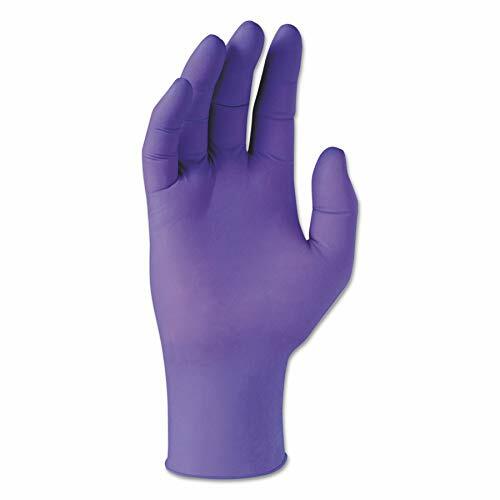 A great quality nitrile glove is another popular choice among medical professionals. These gloves are latex-sensitive and are great for the NRL-free environment. It offers a good biological barrier and is ideal when using certain chemicals. These gloves are available at a relatively expensive price as compared to other types of gloves. Vinyl gloves are ideal for non-aseptic processes and tasks involving a low risk of contact with the body fluid. Such gloves are permeable to blood-borne viruses and possess low tensile strength, because of which they are prone to leakage. The medical gloves made of polythene are usually loose fitting. They have limited tensile strength. Such gloves are not meant for use in clinical areas but are perfect to handle or prepare food. Polychloroprene has physical properties same as NRL and hence is ideal for latex-free environments. Such medical gloves are useful when handling chemicals and when in contact with body fluids. But these gloves have certain environmental issues with disposal. It is because hydrogen chloride is released on incineration. It is a synthetic rubber material used in preparing surgical gloves. Such gloves offer the advantage of having properties almost similar to latex gloves in terms of feel and fit. These gloves are ideal for those who want absolute protection, comfort, and tactile sensitivity. As compared to the neoprene gloves, these gloves offer better functionality. Now let’s check the list of top 10 medical gloves 2018! 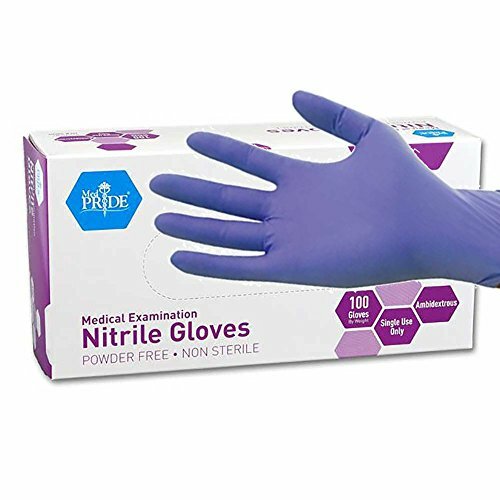 The MedPride Powder-Free Nitrile Medical Exam gloves are the number one in our list. These gloves are the perfect solution for individuals sensitive to natural rubber latex. The gloves come with textured fingertips and offer a comfortable fit. It even holds brilliant tactile sensitivity that makes it fit for use in all sorts of conditions. The gloves have extraordinary strength and great resistance to damage or puncture. Also, it has stretchable durability that offers a great fit for the users. It is available in premium iris blue color and is commonly used by tattoo artists, law enforcement professionals, first responders, and physicians. This medical glove also features smooth external finish and beaded cuff that offers extra durability. It does not leave any residue on hands or emits any odor even when hands are sweaty. The material is flexible enough to conveniently put on and take off. It fits snugly in hands and does not slide, still is non-restrictive. 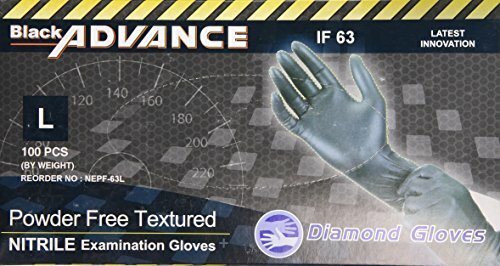 The next medical glove in our list is the Black Advance Nitrile Gloves from Diamond Gloves. These are medium size gloves that come in a pack of 100 pieces per box. They have no added powder and are non-sterile and latex-free. The gloves are made of robust quality material that imparts them great resistance to damage even when you are doing tough jobs. Moreover, the gloves hold excellent resistance to chemicals and moisture and can last longer as compared to the cheap gloves available in the market. 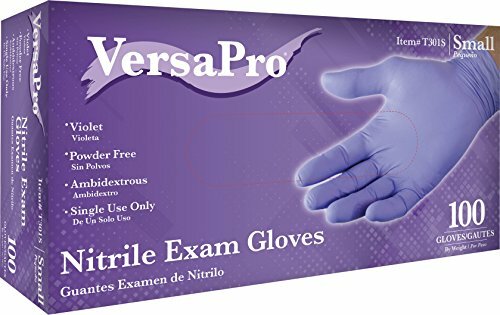 These exam gloves are useful in hospitals and clinics. But you can also use them in auto and tattoo industry. They come in textured and beaded form and offer latex-free fingertip thickness of 6.3 mils. With extraordinary strength and great resistance to damage, the gloves can maintain excellent tactile sensitivity. If you want to buy a medical grade product but are on a tight budget then you can definitely settle for this product. Offering excellent fit and sturdiness, the medical gloves from Kimberly are true value for money. The gloves are highly popular among the users as they offer a good grip and perfect fit to the users. The gloves come with textured fingertips that allow users to work with confidence and ease. The gloves come with easy-to-don beaded cuffs that offer great durability and strength. Made of nitrile, which is synthetic rubber construction, the gloves eliminate the possibility of latex-oriented allergic reactions. It is available in various sizes ranging from small to extra-large. Hence, you can get a glove perfect for your choice. In addition to an ambidextrous design, the gloves are disposable, available in wrist style and possess really good quality. 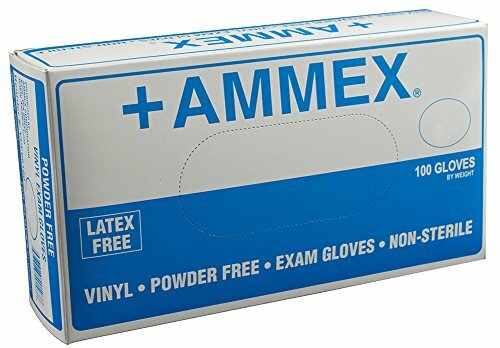 Exam-grade vinyl gloves are approved for medical applications. They provide dependable barrier protection from bodily fluids, blood-borne pathogens, and other contaminants. Vinyl is a synthetic material made from polyvinyl chloride (PVC). It is less elastic than nitrile and latex, giving it a looser fit and a smooth, comfortable feel. Vinyl gloves are less elastic than nitrile and latex, giving it a looser fit and a smooth, comfortable feel. It helps prevent allergic reactions to latex proteins. These medical gloves are exam-grade and therefore perfect for medical applications. They offer dependable barrier protection from the body fluids, pathogens borne from blood, and other contaminants. The gloves are made of vinyl, which is a synthetic material made of PVC or polyvinyl chloride. Hence, the gloves possess excellent elasticity. Though the fit is not excellent and is quite loose, the feel is highly comfortable. Additionally, it prevents allergic reactions to the latex proteins. The gloves are 4 mils thick around the fingers and palm. They are 9.5 inches long measured from the tip of the finger to cuff of gloves. The gloves are available in various sizes ranging from small to extra-large. Moreover, it is available at most affordable prices. You can get the gloves with ease and enjoy them at low prices. The Dynarex medical gloves are an ideal solution for people sensitive to donning powder and natural rubber latex. The gloves are non-sterile, powder-free and possess remarkable elasticity. The gloves are latex-free and are extremely durable. Due to excellent strength possessed by these gloves, you can use them without worrying about the accidental contacts with dangerous pathogens. This product keeps your hands secure and free from bacteria and germs. It is because it contains no allergy causing natural rubber proteins. The medical gloves possess extraordinary strength and have great resistance to puncture while maintaining tactile sensitivity. The gloves are ambidextrous and feel more natural than both vinyl and latex. The powder-free medical glove from Safeguard is 100% safe and meets both ASTM and FDA standards. It is an absolutely safe product that is allergen free and is ideal for all kinds of environmental conditions. It is a premium quality product, which holds great resistance to damage and high durability. The medical gloves possess high elasticity and are comfortable than vinyl and latex. It is superior to latex and a perfect solution for people sensitive to donning powder and natural rubber latex. The glove is ambidextrous in nature that perfectly fits left or right hand. It comes with textured fingers for enhanced grip. The palm and fingers of the glove are contoured ensuring that users have a secure and snug fit. You will get 100 disposable gloves in the pack. The Dynarex 2511 is an ideal solution for people who experience allergy from donning powder and natural rubber latex. The gloves possess no allergy causing natural rubber proteins. They have an extraordinary strength and high resistance to puncture while maintaining the tactile sensitivity. The gloves come in blue color and are available in a pack of 100. They efficiently meet the current FDA regulations. They are useful in all sorts of conditions be it hospitals, chemical industries, and others. The gloves are highly resistant to damage and are extremely sturdy. The gloves have extraordinary strength and ideal for long-term use. It is a 510k registered product that meets or exceed the present regulations. STRONG PROTECTION: Excellent hand and personal protection. Nitrile is chemical and puncture-resistant providing a higher level of protection against liquids, gases and sharp objects. Non-allergenic and non-irritating. 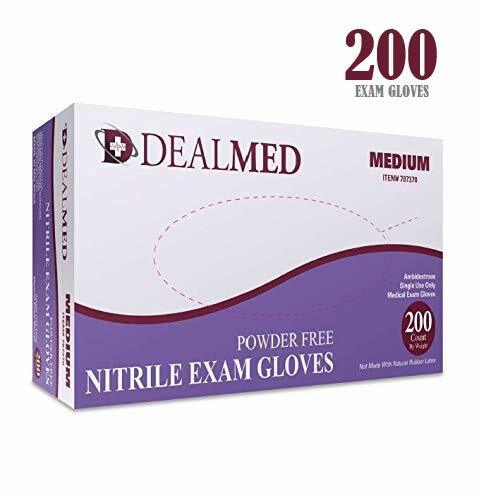 COMFORTABLE FIT: : Dealmed brand Nitrile Gloves are designed for proffessionals by medical proffessionals. We use our experience in the field to specifically design our gloves so they're easy to use and feel comfortable for everyone. From inside and out. Excellent fit, good sensitivity and dexterity for fine tasks. The entire glove is finely textured (including palms and fingers) to provide consistent grip on glass wear, small objects, instruments and tools. USED EVERYWHERE: From Medical Offices to Food Safety Applications. Dealmed Glovess are ideal for almost any application including basic medical procedures, lab work, hair coloring, tattooing, food preparation, painting, cleaning, pet care, home improvement, hobbies, arts and crafts. FEEL CONFIDENT: Consistent quality and reliability - Dealmed and their partners have beenaround for over 80 years. We put our reputation behind everything we produce. Dealmed is known for technical expertise, manufacturing processes and quality control - Guaranteed! The medical gloves from Dealmed are of premium strength and quality. The gloves offer 3ml thick barrier protection and come with smooth textured fingertips. They are made of nitrile and hold great resistant to cuts, chemicals, and tears. The gloves offer a comfortable fit and provide easy accessibility. The gloves have soft tactile sensitivity and greatly elastic fit that offers a secure and snug fit when wearing gloves for an extended period of time. You can open and remove the gloves for easy and quick use. These medical gloves are non-allergic. They are latex and powder-free and do not irritate the skin. It is the best alternative for individuals with skin sensitivity to donning powder and rubber latex proteins. They are ambidextrous and offer a perfect fit. They can be used for food preparation, medical exams, and cleaning. You can use it for indoor as well as outdoor use. These are all-purpose medical gloves that are available for affordable use. 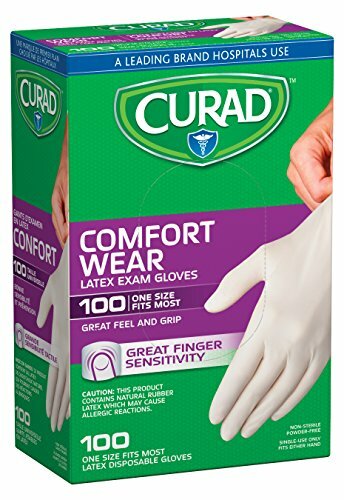 The next medical glove in our list is from Curad. These are latex medical gloves that are available in small or large sizes. The gloves provide a comfortable fit to both the left and right hand. These gloves are designed for single use only but are highly comfortable to wear for a long time. It can fit either hand and one size fits most of the users. The gloves are available in a pack of 100. They offer great comfort and are the best for all sorts of users. They do not hold great resistance to harmful chemicals. If you are looking for medical gloves, which can be a perfect fit for your small hands, then this one from VersaPro is the best choice. It is an economically priced product available in a box form, with each box containing 100 gloves. It is a chemo-rate and FDA approved glove, which makes it suitable for use in hospital settings. Moreover, the gloves come with a textured surface that enhances grip. The gloves are powder-free and latex-free. For this reason, they are perfect for people prone to allergic reactions. In addition to this, the gloves have passed ASTM F1671 test standards and therefore hold excellent resistance to penetration of bloodborne pathogens. They are powder and latex free and meet the Drug, Federal Food, and Cosmetic Act that allows repeated use in direct contact with foods. Medical gloves are highly versatile, but there are other types of gloves also available in the market. This can make things complex and confusing for you. Hence, you must consider some important aspects in order to purchase the best medical gloves. When selecting the best medical gloves, you must have a clear understanding between industrial and medical gloves. Industrial gloves are best suited for applications that involve handling of solvents and harsh chemicals. Such gloves are highly useful in industries like automotive, chemical, janitorial, and food service. Medical grade gloves, also known as exam grade gloves are ideally suited for use where there is a risk of coming in contact with environmental contaminants and bloodborne pathogens. Such gloves are commonly used in medical, dental offices, laboratories, and hospitals. These gloves are tested rigorously and meet FDA standards and guidelines. For this reason, the gloves offer great durability, strength, and barrier for rigid applications. Also, these gloves eliminate potential risks for all kinds of allergies. Most of the gloves are available in different gauges, or thickness ranging between 6-8 mils. These are heavy duty gloves that are designed to perform efficiently under harsh environments. The thicker these gloves are, the better they offer longer permeation timeframe while working with chemicals. Also, the gloves possess great resistance to tear and damage. Also, medical grade gloves offer more flexibility and dexterity. If you want medical gloves that offer enhanced grip and fit, then pick gloves with a textured finish on fingers and palm. Usually, a diamond pattern glove enhances the grip in wet as well as dry conditions. 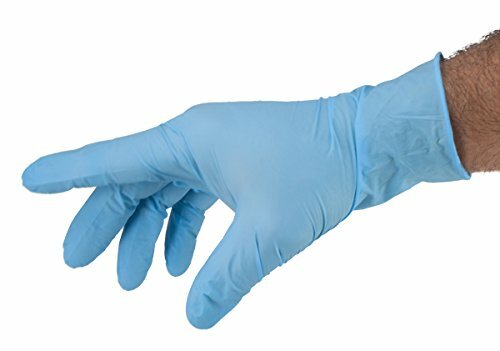 Most of the nitrile medical gloves have a chlorinated finish that reduces stickiness and makes it convenient to pull off and put on the gloves. The two common types of medical gloves available are powder-free and powdered. Powder-free gloves come with a polymer or chlorinated finish, which makes it convenient to doff and don your gloves without the messiness of powder. The powder medical gloves are helpful as it absorbs additional moisture content that aids in putting the gloves. A large number of people underestimate the significance of a well-fitting glove. The size of medical gloves may differ. Hence, it is highly suggested to try samples so that you can determine the size of medical gloves, which a perfect fit for you. With the correct glove size, it is possible to enhance the comfort and increase tactile sensitivity in every application. Another great thing about medical gloves is that they are available in varieties of color. Such colors are designed to promote efficiency and safety in the workplace. With color coding medical gloves, it is possible to assist in differentiating the glove sizes and prevent cross-contamination. The blue color is standard color for medical gloves. The black nitrile gloves are meant mainly for use in automobile applications and work environments related to grime and oil. In case you need additional help, you could wear two gloves at a time. Gloves must always be worn where there is a severe risk of infection. Wear medical gloves only when it is necessary. It is of utmost importance to wear medical gloves when in direct contact with body fluids, blood, mucous membranes or non-intact skin. Avoid using powdered gloves in the medical arena as there are proteins allergens present in NRL bind. This may become airborne and can increase the risk of infection. Make sure you wash your hand properly before donning gloves and right after removing them. Gloves must fit properly as stated by the Health and Safety experts. It is mandatory to change gloves after every session of patient care. There is no substitute for hygiene than medical gloves. Avoid washing your hands with alcohol-based lotions or gels on gloves to enhance usage. Make sure you pick the correct kind of glove for the procedure to be performed. When selecting the next disposable medical glove, be sure to take all these factors into consideration. It is because medical gloves are an important part of the uniform for most of the workers in the healthcare profession. Getting the best gloves for your job is crucial as it can make a huge difference to your day-to-day work. Hence, pick the best medical glove and stay away from all sorts of contaminants and harmful pathogens.